Vary content, pacing, support, and outcomes to meet readers' readiness. Tap into the text complexity toolkit for insight when planning. Vary resource formats to engage different learning styles. Use multiple lesson plans to frame a single text. Create self-paced learning centers with QR codes of author and book readings. Use complete book readings to support all learners. Create tiered companion text lists to expand comprehension of nonfiction titles. Pair fiction and nonfiction texts to build background knowledge. Create book trailer variations targeting a specific audience. Compose a reader's theater script that changes the narrator or point of view. Introduce a character or person using Author Name Pronunciations format. Role-play an author panel after examining author resource pages. 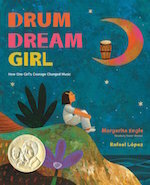 Encourage student participation with Drum Dream Girl: How One Girl's Courage Changed Music by Margarita Engle, who calls out to kinesthetic learners. Use graphic novels paired with the novel such as The Odyssey by Homer and The Odyssey: Graphic Novel by Gareth Hinds to provide content access to all. Mock an interview or create a summary using a book resource page like The Absolutely True Diary of a Part-Time Indian to open the door to creativity. NOTE: For more examples, contact your Implementation and Training Specialist at professionaldevelopment@teachingbooks.net.